The above products all contain a stabilized form of hyaluronic acid. Hyaluronic acid (HA) is a naturally occurring sugar found in various soft tissues of the body. The role of hyaluronic acid (HA) in the skin is to deliver nutrients, hydrate the skin by holding water, and to act as a cushioning agent. HA can be synthetically produced, stabilized and purified for use as these injectable soft tissue fillers. 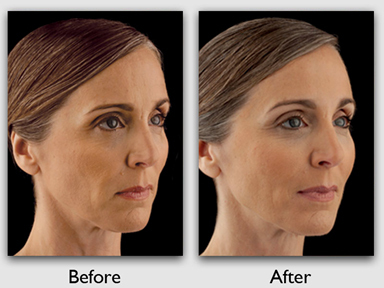 HA filler injections are customized, depending on your needs. They are used to treat wrinkles and lines caused by the volume loss that occurs with age and/or weight loss (loss of collagen, fat and elastic tissue). The most common areas treated include: nasolabial folds (parentheses around the nose and mouth), marionette lines, tear troughs (hollowing under eyes), cheeks, and lips. These products can also improve saggy earlobes and enhance the backs of the hands. How long does it last? When will I see results? Typically these products last 1-2 years. Once injected it will be slowly absorbed by the body. The length of effect is variable per individual and product utilized. You will see results immediately, however, since HA pulls in water (hydration) additional improvement is seen over the next 7-10 days. These products are injected under your skin with a small needle. Your skin will be cleaned and prepped with an alcohol solution to remove oils and bacteria from the surface. An anesthetic cream (numbing medicine) is usually applied 30 prior to the treatment to reduce discomfort. Ice is also used throughout the procedure to help minimize bruising and swelling. Some of the products also contain a small amount of local anesthetic (lidocaine) which also reduces discomfort. Please inform your injector if you have a known allergy or sensitivity to local anesthetics. The depth of the injection(s) will depend on the depth of the wrinkle(s) and the location(s). 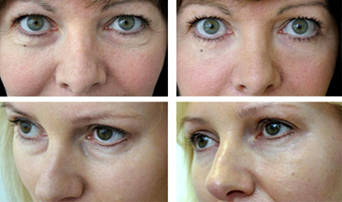 Multiple injections may be necessary depending on the site, depth of wrinkle and technique used. Following each injection, the sites may be gently massaged to ensure proper placement of the product. After your treatment you SHOULD NOT massage the area unless directed to do so by your provider. Occasionally visible lumps/bumps may occur temporarily following the injection; however, these tend to smooth out over time. If the bumps do not resolve, they can be treated with a medication that dissolves the product. Who should not receive these treatments? Patients with known allergies to the components of these gels should not be treated. It is unknown if patients with certain autoimmune diseases (lupus, Sjogrens) will have an abnormal inflammatory response to these products. Patients with autoimmune diseases have been successfully treated, so your provider will discuss any concerns. 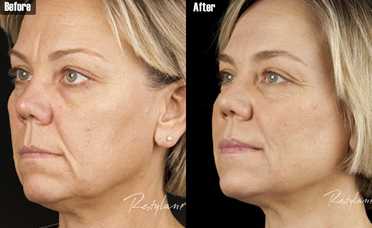 Areas with facial implants (cheek, chin, or lip implants) should be avoided. If medically appropriate, avoid any medications or supplements the increase bleeding or bruising risk (see our handout- How to Reduce Bruising). Please arrive approximately 30 minutes prior to your appointment so the numbing cream can be applied. You should avoid strenuous exercise and alcohol for at least 24 hours after treatment. Application of ice can help reduce swelling and/or bruising if it occurs. Arnica nutritional supplements (available as oral tablets or cream) also helps reduce bruising. Some offices have Arnica cream available for purchase. Can I have other treatments the same day? 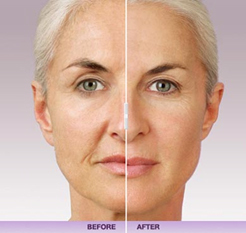 Botox, Dysport and Xeomin can easily be performed during the same visit. If you are considering laser treatment, chemical peels, microdermabrasion or any other procedure that disrupts the skin barrier, there is a possible risk of an inflammatory reaction (redness, swelling) at the treatment site. Will I have my treatment on the same day as my consultation? If you have had treatments before and/or do not want a traditional consultation, we can schedule a same-day treatment. Please communicate this with your scheduler. If the purpose of your visit is to learn about the various products and procedures then please ask for a cosmetic consult. Our providers block time to thoroughly address your concerns during these consultations. If time allows, they may offer to treat the same day, but expect to reschedule. Who performs these procedures and at which offices are they available?